This Triffle was made for my hubsters birthday. He wanted Strawberry Birthday cake, I told him this was my version of Strawberry Birthday Cake. Below I have given you some quick tips to make this dessert easy peasy! 1 pound cake (store bakery brand or frozen pound cake-sliced into ½” slices. ¾ cups sugar or to taste. 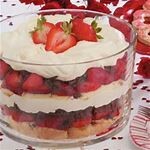 You’ll need a clear glass bowl to assemble the Triffle in. In a deep bowl, dump the package of 3 oz. vanilla instant pudding, add the pint of whipping cream and the 1/3 cup of half & half. Whip on high until thick and stiff peaks form. Refrigerate until you need it to assemble the triffle. In a medium sauce pan with a lid on low heat put 1 pint of cleaned & hulled fresh strawberries. Add the ¾ cups of sugar. Put the lid on the pan and let the berries become mushy about 10 minutes. With a hand held blender, pull the berries off the heat and use the hand held blender to puree them. Then push them through a fine sieve with the back of a large spoon, this will get all the seeds out and make the strawberry puree silky and delicious. Put the puree back on the heat without the lid on for another few minutes until thick. Keep an eye on the puree because it may stick. At this point you are ready to assemble; in a triffle bowl or medium glass bowl start to layer the different components. Begin with the slices of pound cake, then spread a layer of pastry cream, a layer of fresh sliced strawberries, a drizzle of strawberry puree, then the pound cake, alternating ingredients in that order ending with a layer of pastry cream, fresh strawberries and the strawberry puree. Cover and refrigerate for several hours. Serve with sweetened whip cream if desired. Home made Banana Bread is the best, it’s moist delicious with the taste of bananas throughout. I use pecans in mine because I like them better than walnuts. 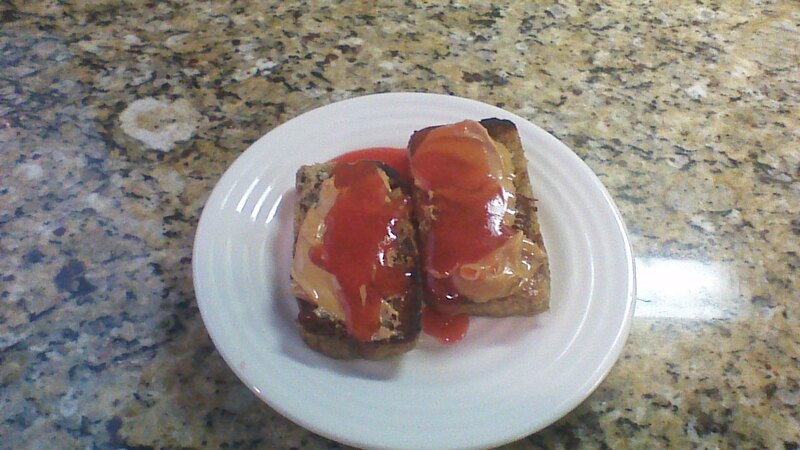 This morning for breakfast, the hubster and I had a delicious treat, pan-fried Banana Bread with peanut butter & strawberry puree. I strain my strawberry puree through a sieve to get all the seeds out and it makes it velvety and divine! The strawberry puree is a pint of fresh or frozen strawberries, since I am the Queen of frozen, mine were fresh frozen. I put them in a pan over low-heat with 1/2 cup of sugar (or to taste), and a pinch of sea salt. Those get cooked over low heat until the strawberries are mushy, and the sugar is dissolved. Turn heat to medium high and watching them very carefully, bring them to a gentle boil for about 2 minutes. Remove them from the heat and with a hand held blender, blend them until smooth. Have a fine sieve (not a colander)over a bowl ready. Pour the now pureed strawberries into the sieve (over the bowl) and with the back of a spoon or spatula for the strawberries through the sieve. When all that is left is the seeds (you may have some solids too) scrape the bottom of the sieve and place the strawberry puree back into the saucepan. Over medium head stirring frequently, cook at a slow simmer until the consistency of a thick sauce. 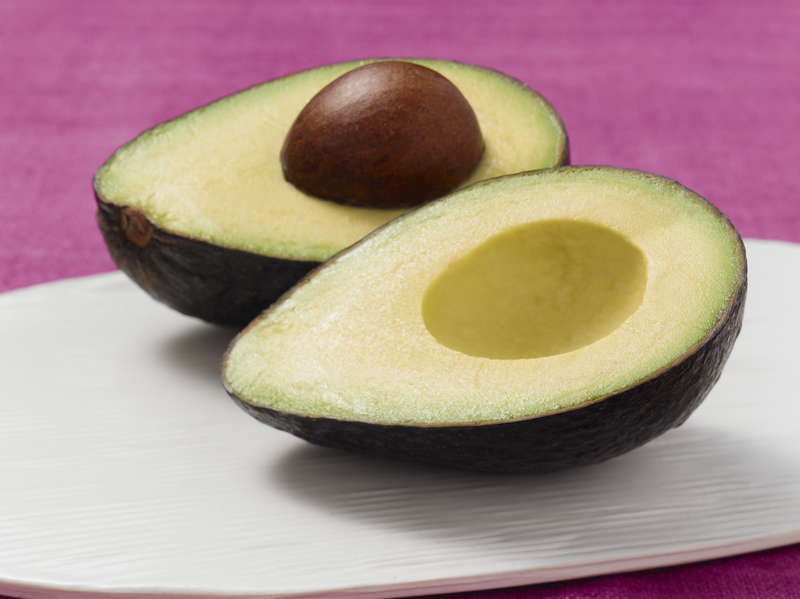 Pull off the heat, pour into a bowl and let cook for 10 minutes on the counter and then refrigerate for up to 2 weeks. Over ice cream, cheesecake, in Strawberry Triffle and as a sauce for french toast, pan fried banana bread, waffles or pancakes! Take slices of banana bread and place in a non-stick skillet with melted butter or olive oil. Mine look small in the picture because I made mini loaves. Cook over medium high heat until browned on the first side, flip and cook till browned on the other side. Place on small plates- spread your favorite peanut butter on it (some peanut butter may cause the bread to tear, so be gentle if using peanut butter that has been ground fresh.) Drizzle your strawberry puree over the peanut butter and serve. Note: Slices of bacon would be delish on this bread! This could easily be made into french toast by dipping your banana bread in a mixture of cream & beaten eggs, cook as directed above. 1 pound thin boneless pork chops or thinly pounded Pork Tenderloin ( I prefer Pork Tenderloin) salted & peppered to taste. Dredge pork chops in flour. Preheat the skillet over high heat, then add olive (remember hot pan cold oil will keep things from sticking), reduce heat to medium high, fry pork for about 3 minutes on each side or until golden brown. Be sure to keep an eye that it doesn’t get burned. Remove pork from the skillet, put on a plate, and repeat with the remaining pork until you have cooked them all. ( You might need to add more oil during the cooking process). Remove the last pieces of pork from the skillet. Then add the sliced mushrooms to the hot skillet and cook until lightly browned. Lower the heat under the skillet to low; add, broth, Dijon mustard, garlic, lemon juice, and whipping cream. Add the pork back into the skillet and cook for another 3 minutes. Serve immediately. Can be held in the oven at 200 degrees until ready to serve. The sauce will separate a little, so remove pork and stir again before serving. Garlic Orzo with fresh Tomatoes and Spinach. Orzo cooked according to the package for 4 people. Cook Orzo according to the directions on the package for 4 servings. Reserve some of the pasta water. Coarsely chop the baby spinach & the basil leaves add to the orzo. Dice 3 Roma tomatoes and add to the orzo. Add the minced garlic and parmigiana cheese, give everything a good stir to combine. At this point taste and salt & pepper to taste. Also, if the mixture looks dry, add a little reserved pasta water to give it creamy texture, but not too wet. 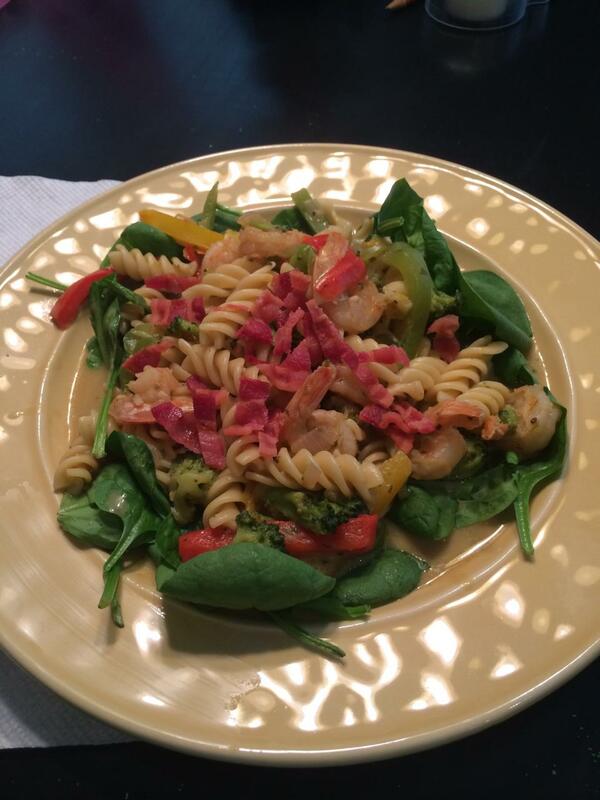 16 oz fresh shelled & deveined shrimp U 25 (medium) (that means there are approximately 25 shrimp in a pound) 16 oz of uncooked frozen medium shrimp-thawed. NOTE: can use diced cooked chicken breast to replace shrimp. Heat oven to 500⁰. Line a baking sheet with aluminum foil; set aside. Combine all the spice mixture ingredients in a small bowl. Dip the shrimp in melted butter then into the spice mix. Place spiced shrimp onto the prepared baking sheet. Bake the spiced shrimp for 5-6 minutes or until shrimp are pink and coating is bubbly. In another bowl combine all the sauce ingredients. To assemble tacos, stack the warmed tortillas onto individual serving plates. Top with 1/8 baked shrimp and ¼ cup coleslaw mix. Drizzle with sauce. Have chopped chives, diced tomatoes and extra sauce to drizzle on tacos. I had the BEST time today, we cooked for a month for my son and his wife. It really works! More next month as we hone our system. we made five sauces, including Cheese, Alfredo, Mushroom and Marsala. Several kinds of meatballs and quinoa among other things. One tip: we used leftover pancakes from breakfast for meatballs in place of breadcrumbs. It worked beautifully! 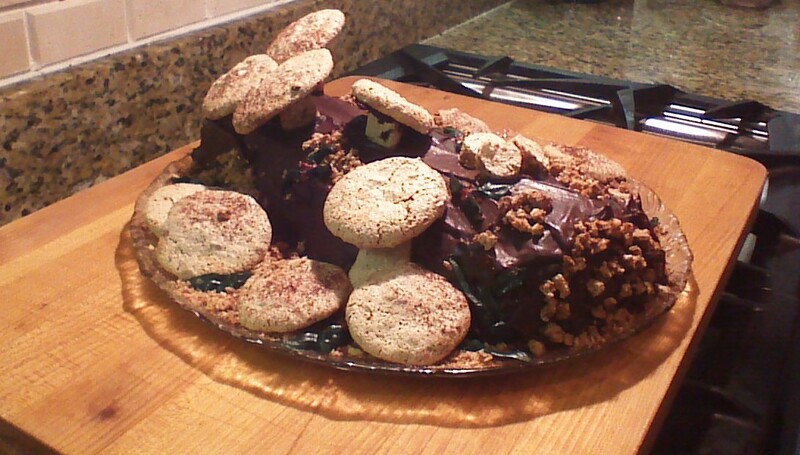 This is my version of Buche de Noel. I had thought I would use a Swiss Buttercream filing, however, I wanted something simpler for the filling. The Caramel Mascarpone Cream filing, fit the bill… here is how I did it. 16 oz. Mascarpone cheese -see notes below. In a saucepan, add the cream and sugar over medium low heat and whisk constantly until the sugar dissolves. Set aside to cool to room temperature. When it’s cooled add the dulce de leche, whisk until completely incorporated and smooth. In a medium bowl add the 16 oz. of Mascarpone cheese. Mix until completely incorporated. Refrigerate until cake is baked and cooled. In a microwave safe dish, put the chopped chocolate, and whipping cream, process on power level 3 for about 3 minutes, remove after 2 minutes and start to stir, stir until the chocolate is melted, you may need to put back into the microwave for the last 30 seconds to 1 minute. Make sure you pay close attention to this process because the chocolate CAN and WILL scorch and be ruined if you don’t pay exquisite attention to it. Treat it gently and you will be rewarded with perfect ganache! Set the ganache aside. Have all the ingredients measured and assembled before you start- mise en place. 1/4 unsweetened cocoa powder (see note below) plus some extra for sprinkling on the towel for rolling the cake. Preheat the oven to 400 degrees. Grease jelly-roll pan & line it with parchment. Spray the parchment with cooking spray and lightly sift cocoa powder. Set aside. Sift the cornstarch, AP flour and cocoa together onto a large piece of parchment. Put the egg yolks into a medium size bowl with the vanilla and half of the sugar. with a hand mixer beat on high speed until ribbons form when you lift the beaters our of the bowl. Set aside. Clean the beaters with very hot water and soap, dry them very well. Any impurities or grease will keep your egg whites from beating up to a stiff peak stage. In a clean bowl place your egg whites, salt & cream of tartar, and with the hand mixer and clean beaters begin to whip the egg whites. When the egg whites are foamy, begin adding the remaining sugar a little at a time until it is fully incorporated. Whip the egg whites until glossy & form stiff peaks… do not over beat. Add a spoonful of whipped egg whites into the whipped egg yolks to lighten them add the rest of the whipped egg whites and gently fold them together so as not to deflate the egg whites. Fold whipped egg whites and yolks together just until no streaks of egg whites are showing. Sift the flour, cornstarch and cocoa powder over the whipped egg white/egg yolk mixture. Continue gently folding just until no egg white or flour streaks are visible. Bake for 10-12 minutes or until a toothpick inserted in the center comes out clean. While the cake is baking, dust a clean kitchen towel generously with unsweetened cocoa powder. When the cake is done, remove from the oven and immediately turn the cake out onto the prepared towel. Peel the parchment off and roll the cake and towel together starting from the long side. Let it cool completely rolled in the towel. When it is completely cooled unroll the cake and spread the caramel Mascarpone cheese cream evenly. Re-roll the cake carefully and place on a serving platter. Spread ganache over the rolled cake. I re-glazed my cake several times refrigerating it in between. Decorate with meringue mushrooms if desired. You can also decorate with chopped nuts. Refrigerate until serving time. For chocolate I bought Ghirardelli chocolate chips at Costco. I would also suggest getting the Mascarpone cheese there too, its much cheaper. To roll filled cake leave it on the towel when filling and use the towel to assist in rolling the cake after its filled. Cocoa powder I used Ghirardelli cocoa powder which I bought at World Market. I would also suggest going to amazon.com for hard to find ingredients. This would be delish with peanut butter buttercream. I suggest using a trusted site for a Swiss Meringue Buttercream recipe and adding about 1/4 cup smooth peanut butter to that at the end and mix until well blended. I like the texture of the Swiss Meringue Buttercream, I think it would create a superb filling! Whisk milk & flour first in small saucepan. Cook over medium heat until thick, stirring constantly. Cool completely and set aside.Mix sugar, butter, and vanilla together with electric mixer until fluffy. Add flour mixture a spoon at a time and beat until smooth and fluffy. I had to take a little “bunny-trail” trip this afternoon after work. I am a notorious sucker for bakeries…any kind of bakery, the more ethnic the better I like it…but that is another post for another day. Well, on my bunny-trail-trip this afternoon I had to go to pick up a prescription at “Old Town” Mount Pleasant SC. I had never been there before, in fact, didn’t even know a place called “old town” existed in Mt Pleasant, SC. It was adorable, quaint with narrow streets, funky parking though and the narrow streets are such that only one vehicle at a time can get through and the parking is not parallel, but horizontal, facing the opposite way from where I was coming. So I made my own parking place, swept out of my car and walked with confidence and purpose down the street to my appointed destination; hoping against hope that I didn’t have a “quaint” parking ticket waiting for me when I returned. I wish I had had a little more time to explore this short but intriguing street. It looked like it had been plucked out of a 40’s era picture show, in fact I was sure I was gonna see Sheriff Andy and Opie walking down the street with their fishin poles! However, one had to look past the modern cars parked vertically on the street…well by now you’re reading this going, um…where do the cinnamon rolls come in…please be patient whilst I “set the stage” for their illustrious appearance! The Pharmacist came out from the counter and brought me my cream concoction & patiently and kindly with a smile explained what it was, how to use it and said, “you have a wonderful evening.” I paid for my purchase and hurried out the doo afraid of what I would find when I returned to my wonky-parked car…however, a BAKERY had caught my eye on the way to the pharmacy, and so I stopped…it was again, old fashion looking with very high counters and a case full of yummies…I chose the cinnamon rolls…two of them piled high with creamy dreamy frosting. The person who waited on me at “The Village Bakery” was pleasant and very helpful. I told him that the rolls looked so good that they might not make it to breakfast the next morning. When I got home, I took them out of their box and placed them on a plate to take a picture of them, see above. I took a taste of the frosting, it tastes like cream cheese French butter cream…it is divine w/o being too sweet.